The Star SCP700 has been discontinued. No direct replacement is available. 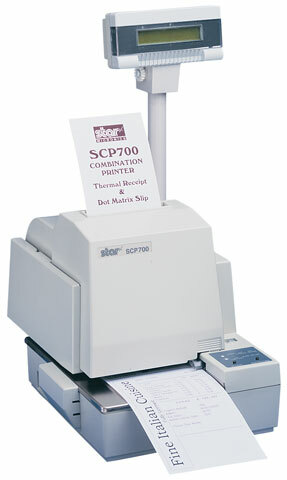 The SCP700 combines the speed of a direct thermal receipt printer with the functionality of a dot matrix slip printer. Star Micronics has created the world's first truly flexible combo printer, the SCP700. Optional dual interface with data pass through functions make possible system configurations previously unavailable. These configurations, ranging from simple combo printer alone, up to a complete virtual POS device, including thermal receipt and impact slip printer, customer display, dual cash drawer, MICR Reader, Magnetic Stripe Reader, Barcode Scanner, Signature Capture, and Pin Pad, all controllable through a single serial or bidirectional parallel interface. Combo Printer. DT receipt printing, 16.7 lps, 3.15" print width. Impact slip printing, 3.1 lps, 7.17" print width. Serial interface. Order cables & power supply/AC adapter separately. See accessories. RIBBONS BLACK RIBBON, DP8340 BLACK RIBBON, 800K CHARACTER LIFE. Also known as SF-03B. Ribbons DP8340, Red or Black color, Single Ribbon. Also known as SF-03BR.